Clip Art and Black and White Download with 6 Color Images and 6 Black and White Images. All images are high quality 300 dpi for beautiful printing results. 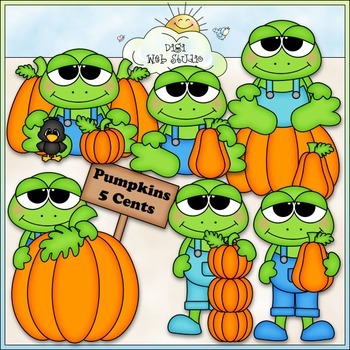 Includes: 1 frog wearing bib overalls and sitting in a pumpkin patch with a black crow, 1 frog wearing bib overalls and sitting while holding a pumpkin, 1 frog wearing bib overalls and sitting on a large pumpkin, 1 frog wearing bib overalls and standing behind a pumpkin with a sign with wording of: PUMPKINS 5 CENTS, 1 frog wearing bib overalls and standing behind a stack of 3 pumpkins, 1 frog wearing bib overalls and holding a pumpkin. 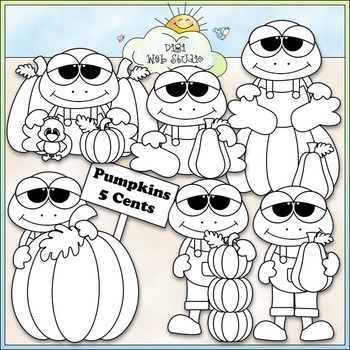 Leah Rae (Digi Web Studio) is licensed by Kristi W. Designs to use tools to create designs for sale under license No. DWSKWCARS1. Give Credit: You MUST give credit to me (Leah Rae) by linking (providing an actual clickable link if possible) to: www.digiwebstudio.com in each product description and to Kristi W. Designs (www.bearnecessitiesscraps.com). Also provide text credits somewhere within your project file (any page inside your document is fine). Sharing / Freebies: You may NOT design or create anything to share or give away for free. The ONLY exception is you may give away an occasional product you've designed for the purpose of a business sample or promotion. It goes without saying that you must also NEVER SHARE with anyone any purchases you make from Digi Web Studio as this is illegal.